Author(s): Bartley, O.; Rienecker, K.; Stickland, R.; Pass, R.; Bunga, A.; Cross, E.; & Fagg, J.
Affiliations: Cardiff University, Wales, UK. Abstract: The information age has propelled scientific progression into the public eye, and the pursuit of advancing knowledge is no longer a closed topic. The academic world has been relatively slow to adapt, but recently we have begun to see institution focused interest in public engagement. As this change occurs, it is becoming apparent that effective science communication is gradually becoming another criteria of the modern scientist. Several grant funders and institutes now require researchers to engage in science communication, and actively seek this skill during recruitment. Yet for those of us at the beginning of our careers, communicating high level concepts to a lay audience in a non-academic way is an untrained skill. Furthermore, existing outlets for science communication to build these skills tend to be inflexible and highly time consuming. 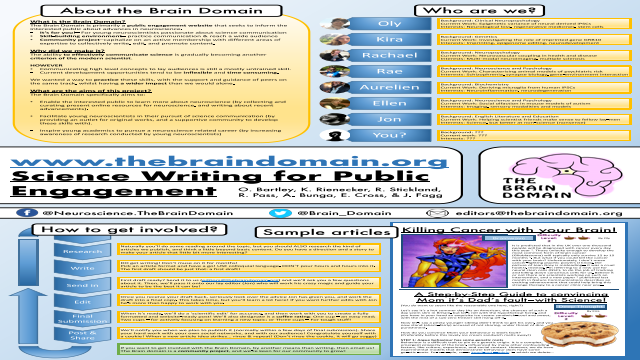 The Brain Domain is a blog and article focused public engagement website, geared towards helping young neuroscientists improve their skills in science writing and communication. It is designed to take advantage of an active writing community to collectively edit and improve our science writing skills. We aim to achieve this in a way which does not interfere with work, and subsequently have no required publishing quotas, which means writers can submit articles when they have spare time or inspiration. Additionally, this enables the writer to determine how involved they want to be. Whilst there are general guidelines and article structures, we want to encourage writers to explore any topic of neuroscience they are interested in. This is enabled through communal editing, to improve both readability and scientific accuracy. The Brain Domain also benefits from an in-house lay editor, who can offer advice on structure and lay understanding. The Brain Domain is free, however we rely on social media to improve our impact and reach, and ask that writers occasionally promote articles other than their own.